Government bonds tumbled around the world and the dollar rose on speculation that the economic outlook is sufficiently strong to allow the Federal Reserve to step up the pace of interest-rate hikes. Metals and crude oil fell. Portuguese and Italian debt led declines in Europe, while Treasuries also fell and Japan’s 10-year bond yield increased to the highest level since February. Russia’s ruble lost the most among emerging-market currencies as the dollar rallied. Crude oil reversed an earlier gain with U.S. stockpiles forecast to increase and optimism waning that OPEC’s latest push for a production-cutting deal will pay off. 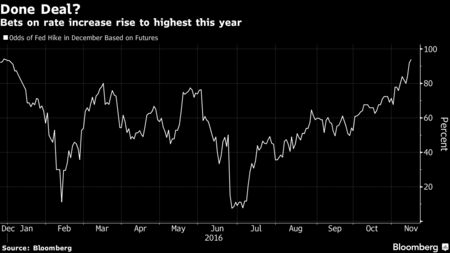 Zinc fell from a six-year high as industrial metals sank. European shares ended two days of gains as chemical companies dragged the index lower. Reaction to Donald Trump’s ascendancy to U.S. president has defied expectations. While analysts spent early November warning a Trump administration would hurt economic outlook and slow the pace of rate increases, his election has instead made Fed action a near certainty. The odds of an increase in interest rates by December have risen to about a 94 percent probability, the highest level this year, from 68 percent at the start of November, on speculation the Republican’s policies will boost inflation. St. Louis Fed President James Bullard said there’s a chance the U.S. economy could get a medium-term boost if Trump increases infrastructure spending and tax reforms. “The inflation story is still in play,” said Birgit Figge, a fixed-income strategist at DZ Bank AG in Frankfurt. “The market is expecting an interest-rate hike in December, and there is no fundamental reason for the Fed” to disappoint, she said. Fed Presidents Neel Kashkari and Patrick Harker are both scheduled to speak Wednesday and may shed more light on the likely trajectory of borrowing costs in the world’s biggest economy. Fed Chair Janet Yellen is scheduled to testify to the Joint Economic Committee of Congress on Thursday. The yield on Treasuries due in a decade rose six basis points to 2.27 percent as of 11:25 a.m. London time, after retreating from its highest level of the year in the last session. It’s up more than 40 basis points since Trump’s election, having surged amid growing speculation the Fed will boost interest rates next month and beyond. The bond-market rout pushed Bank of America Corp.’s Global Broad Market Index down 1.5 percent in November, heading for the biggest monthly decline since May 2013. The renewed selloff spread to Europe, with the yield on Portugal’s 10-year bonds adding 15 basis points to 3.62 percent. Italy’s 10-year yield increased eight basis points to 2.04 percent, while that on similar-maturity German bunds climbed two basis points to 0.33 percent. Japan’s 10-year government bonds fell for a fifth day, lifting their yield to 0.027 percent. Tuesday marked the end of almost eight weeks of negative rates, the first time the bond market has tested the Bank of Japan’s resolve to contain 10-year yields since it shifted its focus to controlling the benchmark yield around zero. The BOJ said after its September meeting that it could carry out unlimited bond-buying operations at a set rate, if needed, in order to control yield levels. After that meeting, the bond market rallied in search of a floor for the 10-year note yield, eventually settling just above the minus 0.1 percent policy rate. The Bloomberg Dollar Spot Index, which tracks the U.S. currency against 10 major peers, rose 0.4 percent. It slipped on Tuesday after surging more than 3 percent in the four trading days following the Nov. 8 U.S. election. Currencies of commodity-producing nations, including the Australian dollar and South African rand, were among the biggest losers. The MSCI Emerging Markets Currency Index declined 0.4 percent and Russia’s ruble dropped 2 percent, after jumping 2.9 percent on Tuesday, the most since February. Turkey’s lira, Poland’s zloty and Mexico’s peso all dropped at least 0.7 percent as higher U.S. yields boosted the dollar. The yuan fell to 6.8776 against the dollar, the weakest since December 2008 and beyond a Bloomberg survey’s year-end median estimate of 6.8. Standard Chartered Plc on Wednesday joined at least four other banks in lowering its forecasts for the yuan, predicting a year-end level of 6.9, compared with 6.75 earlier. Crude oil fell 1.3 percent to $45.24 a barrel in New York, after earlier rising as much as 0.8 percent. Oil retreated for the past three weeks amid skepticism about the ability of OPEC to implement a deal at its Nov. 30 meeting. The group is seeking to trim output for the first time in eight years as Iran boosts production and Iraq seeks an exemption because of war with Islamic militants. Prices will probably remain around current levels if OPEC fails to cut, according to BP Plc Chief Executive Officer Bob Dudley. U.S. crude stockpiles expanded by 3.65 million barrels last week, the industry-funded American Petroleum Institute was said to report Tuesday. Government data Wednesday is forecast to show supplies rose by 1 million barrels. Copper and aluminum declined in London, extending their retreats from one-year highs reached last week, and zinc retreated from its highest close since 2010. Metals rallied last week on a combination of increased speculative interest in China and optimism Trump’s pledge to spend as much as $1 trillion on infrastructure will boost demand. The 14-day relative strength index for the London Metal Exchange Index climbed as high as 87 last week, well above the 70 threshold that signals to some traders prices may have risen too far, too fast. The Stoxx Europe 600 Index was little changed, paring gains of as much as 0.6 percent. Nokia Oyj rebounded from a three-day losing streak, pacing technology stocks higher as Nordea Bank AB raised its recommendation on the Finnish network manufacturer to buy. Vodafone Group Plc contributed most to gains among telecommunications companies. Bayer AG sank 4.9 percent, dragging chemical companies to the worst performance on the Stoxx 600, after issuing 4 billion euros ($4.3 billion) of convertible bonds. Among stocks moving on corporate news, Wirecard AG, a German payments provider, gained 7 percent as the top end of its 2017 profit forecast exceeded some analysts’ estimates. Hugo Boss AG slipped 9.1 percent after saying it will eliminate two brands and slow down expansion of its store network. ICAP Plc slid 6.3 percent after the company, which will soon transform into market operator and trading services firm NEX Group Plc, reported a 7 percent decline in half-year pretax profit. S&P 500 Index futures slipped 0.2 percent, after the equity gauge rose 0.8 percent Tuesday. As earnings season winds up, Lowe’s Cos. and Target Corp. will be in focus for indications of the health of the U.S. consumer. About 76 percent of S&P 500 members that have reported so far beat profit projections and 56 percent topped sales estimates. The MSCI Asia Pacific Index added 0.2 percent. Japan’s Topix index rallied to a nine-month high, driven by gains in banking stocks as investors bet earnings at financial companies will benefit from the recent pickup in bond yields. The Topix Banks Index has jumped more than 20 percent in five days, the steepest surge since 2008. The MSCI Emerging Markets Index rose for a second day, adding 0.2 percent. Abu Dhabi bank shares surged, led by a 13 percent rally in Union National Bank PJSC. Four people with knowledge of the matter said the emirate is weighing a plan to merge Abu Dhabi Commercial Bank PJSC and Union National Bank and also combine Abu Dhabi Islamic Bank PJSC with Al-Hilal Bank PJSC. The benchmark index advanced 2.6 percent, the most since June.